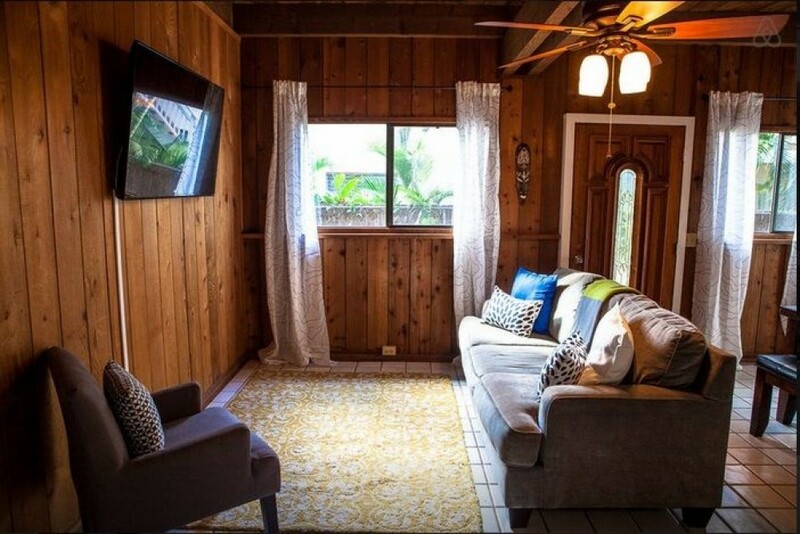 The Sunset Surf Bungalow is a custom tropical home in a very quiet neighborhood, just steps away from world-famous Sunset Beach, North Shore, Oahu, Hawaii. The property is nestled between other homes, 3 blocks in from the highway. Taking a little stroll will lead you to the beach in no time. Just a short 45-minute drive from the Honolulu airport and Waikiki. The area is world-famous for big wave surfing, spectacular sightseeing, and whale watching. The beaches here are some of the most beautiful beaches on earth. Stroll to the beach (a 1-minute walk) to catch the endless stunning sunsets that give the 'Sunset Beach' its name. * Washer and Dryer on the side of the house are available for guest use. * Guests can rent electric or regular bicycles at a nearby rental shop. A great quiet hideaway for the family in an awesome location!" The North Shore is a nice getaway from Waikiki with a bike path to use (for running, walking as well) and close to some of the best surf breaks in the world. This house is a short walk to the famous Ted's Bakery and just north of Sunset Beach. The whole family enjoyed it. I can not say enough praise for Lavish Getaways and the Sunset Surf house. We were a big group with people from SF, Paris, Sydney and Honolulu and we all felt at home at the Surf House. Close walk to Sunset Beach, clean and stylish with everything we needed. It was great having the large kitchen, fully stocked bath and downstairs inlaw for the family and kids. John the local caretaker was there when we needed him and we were a difficult bunch that needed personal attention. A cozy lani to chill our each day/night and wifi, cool fans, a cupboard well stocked. Screened windows to keep away the mosquitos, extra fans for cool time, a pack and play for babies, guide books, chairs and mats for the beach. We couldn't have been happier with our stay at the Sunset Beach House. I know it's not the look out the window and see the beach view, but believe me you are steps from the beach, playground, Ted'sBakery, the best food trucks ever and all the North Shore has to offer. Thank you for making my 40th birthday holiday perfect. Everything we wanted, loved the clean and quality sheet and towels, the supplies and the beach towels and chairs. The upstairs fringe was broken and not as cool as the downstairs fridge, but could have been 8 people lot's of food and one fridge open often. Thanks for dealing with our drama too. please let me know if there is anything I can to do help you out in the future. I'm a tv news photog and can make you a nice video if that would help in future rentals. Erika at Lavish Rentals was beyond an above awesome in helping us and describing your property.